If you weren’t quite sure, this week’s Wildcard Wednesday should definitively confirm that music countdowns are Jen’s favorite topic. Though not quite ready to commit to naming her top five albums of all time (a followup to last week’s list on the book side), she shares the five albums that changed her life, and a little of the story behind each. And there’s a wide range of sounds, from classic crooner to hard rock to lush Hawaiian. We’d love to hear what albums served as the soundtrack to the greatest moments and epiphanies in your life, and of course any embarrassing stories that go with them. This entry was posted by Ryan on August 30, 2011 at 1:00 pm, and is filed under Music, Podcasts, Wildcard. Follow any responses to this post through RSS 2.0. You can leave a response or trackback from your own site. I really appreciate acoustic music. I like artists who play and sing well and who write. That is why I am drawn to Bluegrass, Celtic, and Hawaiian music. I have You two as well as V. Brown over at 808Talk to thank for the Hawaiian side of things. I LOVE Darin Leong’s music. His instrumental style is great. I also bought the main group of the Hawaiian iTunes Essentials and enjoyed it. I will have to pick up that Hapa CD. Thanks! Considering 1988 was such a pivotal year, how about your Top Five from 1988? I’d have to list “Diesel and Dust” by Midnight Oil, “Beelzebubba” by the Dead Milkmen, “The Long Acre” by In Tua Nua, “Life’s Too Good” by the Sugarcubes and “Winter Was Hard” by Kronos Quartet. 1987, though, is where it’s at. 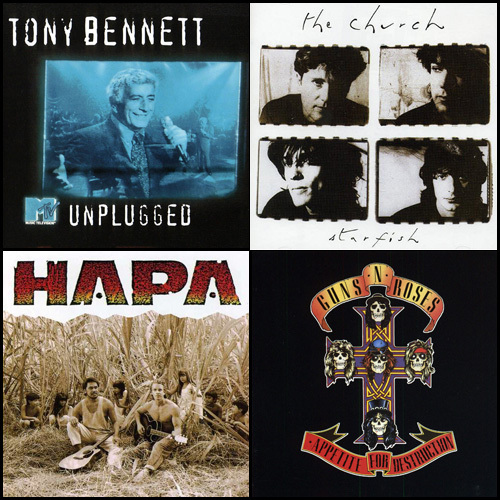 In addition to “Appetite for Destruction”, that year yielded “The Joshua Tree” by U2, “In My Tribe” by 10,000 Maniacs, “The Lion and the Cobra” by Sinéad O’Connor, “Le Mystere de Voix Bulgares” and so, so much more.